Do you ever wonder if you have missed out on God’s plan for your life? I’ve tried all kinds of things in an attempt to make sure that I’m not missing out on God’s plan. I’ve prayed, I’ve fasted, I’ve spoken to friends, and I’ve tried anything I thought God might want me to do. I’ve been a jewelry designer, a bookkeeper, a paramedic, an outdoor education instructor, a pregnancy crisis counselor and a television producer. All in a desperate attempt not to miss out on anything God has for me. And then I read the story of Jonah. 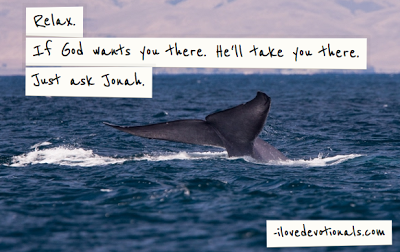 Jonah didn’t really like God’s plan so he tried to go in the opposite direction. But God sent a whale to swallow him like plankton. Why do I like that story? I like that story because it reveals that Jonah - who was actively rebelling against what God wanted him to do - was guided by God to the exact place God wanted him to be. It helps me realize that if I’m actively seeking to God’s plan for my life he will make sure that I stay on course. In the story of Jonah I discovered that it is a lot harder to miss out on God’s plan for our lives then I thought before. God is consistently, and lovingly, guiding you to the exact place he needs you to be right now. Knowing that God will send a whale if you go off course has allows you to stop rushing around, trust God with your life, and recognize that he is in control. Has there been a time in your life when you can see God sent a whale? Ask God to send a whale when you’re going off track and to keep you on the path he has for you. If this resonated with you share it on twitter or facebook. I’d also love to connect with you on pinterest, facebook or twitter. This devotional orginally appeared on Gateway News.